Lately, Mother Nature has been giving us a little taste of autumn. And what better way to enjoy this crisp, cool air than around a cozy outdoor fire? Let the weather forecast be your guide. If it’s windy, a fire can spread quickly and uncontrollably, warns West Bend, an insurance company carried by Dupaco Insurance Services. “If it’s windy out, don’t start a fire,” Bemis says. Remember: Location, location, location. Fires must be at least 15 feet away from any structure and may not exceed five feet in height, according to the Dubuque Fire Department. All vegetation and combustibles should be removed from the area ahead of time. Use the right equipment. The city of Dubuque requires recreational fires to be in an approved container or fire pit no larger than 36 inches in diameter. Burn only charcoal products or natural wood, and avoid burning processed woods, building materials, paper and yard waste, the fire department warns. Keep tabs on children and pets. “When people use wood that’s not quite dry, it pops and sends embers outside the fire pit area, so always keep an eye on kids and animals,” Bemis says. Be prepared. Keep a portable fire extinguisher, garden hose or sand and a shovel on hand for immediate use, the Dubuque Fire Department advises. Don’t move a fire pit or ashes too soon. 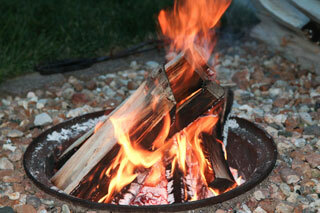 Portable fire pits stay warm long after the embers burn out, West Bend warns. Wait until at least the next day before moving the fire pit or ashes near a structure. “People think the embers have burned out and dump them in the garbage can alongside the house, which then catches the trash on fire, which in turn catches the house on fire,” Bemis says.